If you can’t find it here it’s probably still in the Ocean! 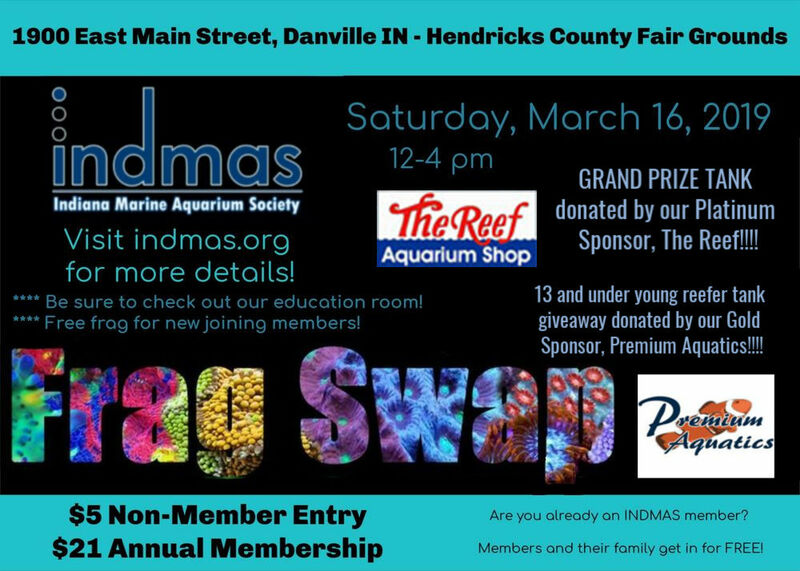 Lots of great things to look forward to with the upcoming 16th annual 2019 INDMAS Frag Swap! This year our Platinum Event Sponsor is The REEF! 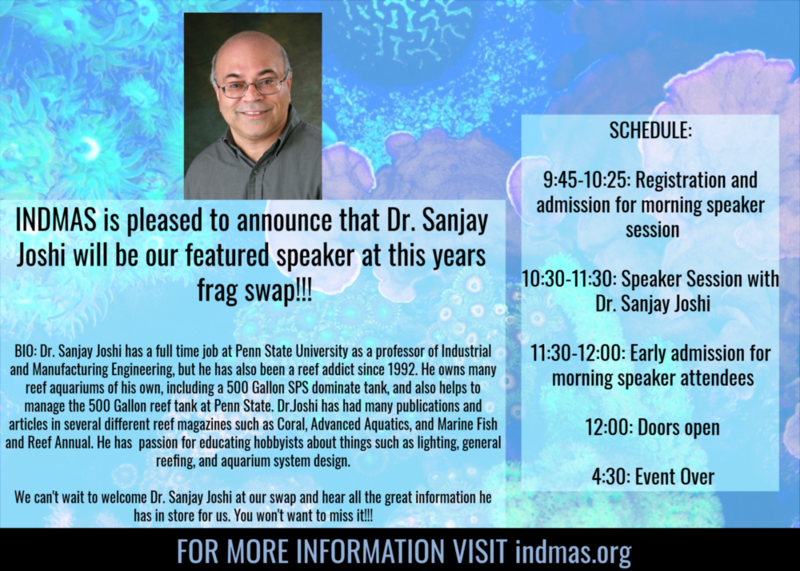 We are excited to announce that our guest speaker this year will be Dr. Sanjay Joshi. Sanjay has a full time job at Penn State University as a Professor of Industrial and Manufacturing Engineering, but he has also been a reef addict since 1992. He owns many reef aquariums of his own, including a 500 gallon SPS dominate tank, and also helps to manage the 500 gallon reef tank at Penn State. Dr. Joshi has had many publications and articles in many different reef magazines such as Coral, Advanced Aquatics, and Marine Fish and Reef Annual. He has a passion for educating hobbyists about things such as lighting, general reefing, and aquarium system designs. We can’t wait to welcome Dr. Sanjay Joshi at our swap and hear the great information he has to share with us all. You won’t want to miss it!! Again this year we will have a 13 and under children’s tank raffle. This is an Innovative Marine 10 gallon all in one setup donated by our gold sponsor Premium Aquatics! Every attendee 13 and under will receive an entry. Stop by the INDMAS table for your entry! The Club members will provide a free frag for our new joining members. If you are thinking of joining, print out the membership sheet posted in the 2019 Frag Swap Forum and fill it out in advance. This will greatly reduce your wait in line! I just wanted to make sure but are we selling INDMAS Tshirts? Someone has asked me about it. Thank you! Only one more day until the best swap around!